The so-called Makabayan bloc in the House of Representatives has expressed dismay with a Sandiganbayan decision granting former first lady and now Ilocos Norte Rep. Imelda Marcos temporary freedom after she posted P150,000 bail on Friday. “Very double standard! Very shameful of the high magistrates of the Sandiganbayan bowing down to the high and mighty Marcoses for the whole world to see. Very disappointing!” Anakpawis Rep. Ariel Casilao said in a statement on Friday. Bayan Muna Chairman and former congressman Neri Colmenares echoed Casilao, pointing out the stark contrast of the justice system between the poor and those in power. 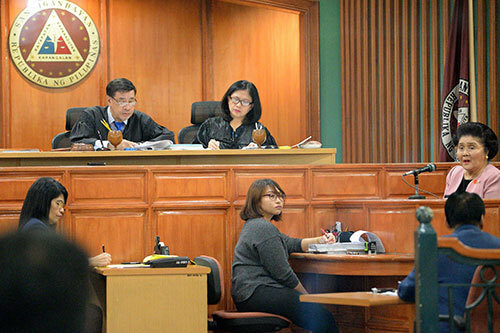 “This also shows the seeming double standard in the Philippine justice system. Kapag mahirap ka ay sasabihin ng pulis ay sa presinto ka na magpaliwanag, pero kapag mayaman ka o Marcos ka pa, ang pulis pa ang magpapaliwanag (When you are poor, the police will tell you to explain yourself in the precinct, but if you are rich or you are a Marcos, it’s the police who will explain for you),” he added. Gabriela Rep. Emmi de Jesus described the verdict as “abhorrent” and “beyond mockery of justice” in the country. Then-President Ferdinand Marcos, Imelda’s husband, declared military rule in 1972. Akbayan Rep. Tom Villarin and Bayan Muna Rep. Carlos Zarate also criticized Mrs. Marcos for failing to attend the November 9 promulgation and citing ailments in her plea but managed to make time for the birthday party of her daughter Ilocos Norte Gov. Imee Marcos in San Juan City the same night. “While she is suffering from ‘multiple organ infirmities’ and is ‘under strict orders’ to avoid stressful situations that would put her at risk of a heart attack or seizure according to her explanation to the court, her actions and demeanor say otherwise,” Villarin said. The Sandiganbayan Fifth Division convicted Mrs. Marcos in seven out of 10 graft cases for using her position in public office to manage several Swiss accounts from 1968 to 1986. In a hearing of her “Motion for Leave of Court to Avail of Post Conviction Remedies” Friday last week, she maintained that had she known about the initial verdict last week, she would have gone to court.